Disease? Not On My Farm! 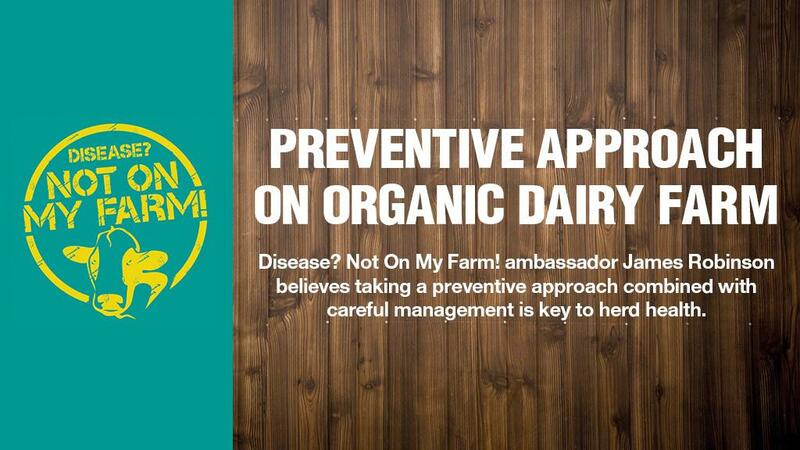 ambassador James Robinson believes taking a preventive approach combined with careful management is key to herd health. Prevention is better than cure has always been the ethos for James Robinson, who farms at Strickley, near Kendal. But running an organic herd of 130 Dairy Shorthorns makes this even more important, as the use of antibiotics and anthelmintics are only permitted in certain circumstances. Mr Robinson says calf and subsequent heifer health and productivity is influenced before birth with careful dry cow management. He says: “We feed calves their own mother’s colostrum, ensuring they get sufficient colostrum within two hours of birth, but it is essential this is of good quality with plenty of antibodies, and I believe good dry cow management is essential for this. Mr Robinson works with his vet Kirsty Ranson, of Westmorland Veterinary Group, to monitor calf and youngstock health very closely. Last year, for the first time in many years, the farm had an outbreak of rotavirus in calves. Mr Robinson says: “We do not know what prompted it and it really knocked back a batch of about 20 calves. The herd is also vaccinated for leptospirosis, BVD, IBR and salmonella, as Mr Robinson explains: “We have been vaccinating against BVD for more than 20 years and also against IBR. We have never had a problem, but because this is a heavily stocked area, it gives us protection and adds value to stock. This is also a challenge when dealing with liver fluke, which Mr Robinson believes is a nationwide problem. He says: “We try to manage grazing to limit fluke damage, but a problem for us is flukicides with a four-and-a-half-day milk withdrawal only treat adult liver fluke.